Demon Inside is a sequel to Personal Demons, a fantastic urban fantasy book! So if you haven't read the first book, buy them both now! It's been three months since psychologist Megan Chase made the stunning discovery that the world is filled with demons, and once more the situation is too hot to handle. 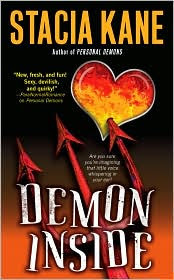 Ironically, Megan -- the only person in the world without a little personal demon sitting on her shoulder -- has become the leader of a demon "family," but now some unknown arcane power is offing her demons in a particularly unpleasant fashion. And while her demon lover Greyson Dante is still driving her wild with desire, he's also acting strangely evasive. Then there's the truth about Megan's past -- the truth she's never known. Caught between personal problems and personal demons, Megan is having one hell of a hard time. Will the help of her Cockney guard demons and her witch friend Tera be enough so that Megan can finally resolve the past, survive the present, and face the future?